We compared the efficacy of the microdrop and minimum volume cooling (MVC) methods for the vitrification of in vitro-produced porcine zygotes and blastocysts after equilibration in low concentrations of cryoprotectant agents. Zygotes and blastocysts were equilibrated in 2% (v/v) ethylene glycol and 2% (v/v) propylene glycol for 13–15 min. Then, they were vitrified in a medium comprised of 17.5% ethylene glycol, 17.5% propylene glycol, 0.3 M sucrose, and 50 mg/ml polyvinylpyrrolidone either by either dropping them directly into liquid nitrogen (microdrop method) or placing them on Cryotop sheets in a minimum volume of medium and plunging into liquid nitrogen (MVC method). Both zygotes and blastocysts were successfully vitrified. 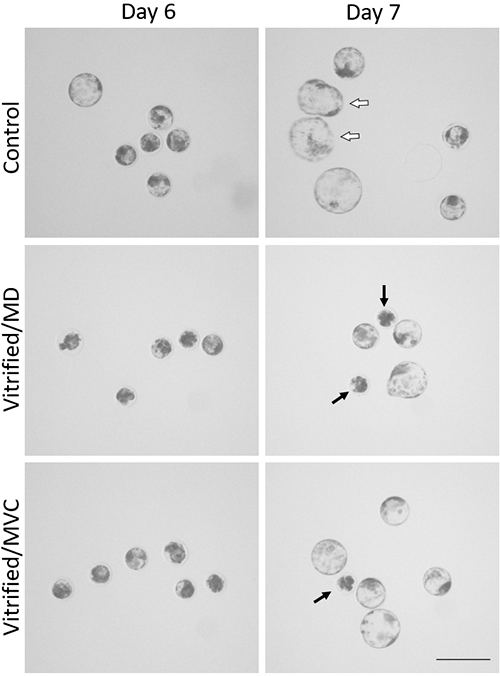 For the vitrification of zygotes, the MVC and microdrop methods were equally effective; however, for blastocyst vitrification, MVC was superior. For both methods, the vitrification of zygotes produced higher-quality embryos than the vitrification of blastocysts. Produced and listed by : IPEC Inc.